IDENTIFYING POLONIUS - WHO IS THE DADDY? This question is one beloved of conspiracy theorists and other fantasists; those who wish to present an alternative to William Shakespeare of Stratford as the man (or woman) who wrote the poems and plays that bear his name. When engaging upon a quest to construct a dubious persona it is necessary to present some kind of evidence. Where the historical evidence is slight or unrecorded, as in this case, then the temptation to manufacture some becomes overwhelming. So far as the works of Shakespeare are concerned, if it can be claimed that they are autobiographical, then the Works provide all the potential “evidence” needed to identify an alternative author. Anyone can search through the poems and plays for characters and circumstances that fit a chosen candidate who is then revealed as the “real” Shakespeare. This is not difficult as a dramatist invariably draws from what he has personally observed, along with what he knows or has heard regarding contemporary affairs. All that is required is to tease out those words in the plays that suit the purpose and use them as evidence to support the argument. The problem with the Shakespeare controversy is the number of alternative candidates that are claimed as being him. There are over fifty and obviously they cannot all share the same life, yet it can all too easily be made to appear that they do. Thus we find in the play Hamlet, Polonius often being compared to Lord Burghley in the life of Edward De Vere, 17th Earl of Oxford. William Cecil, Lord Burghley was Queen Elizabeth’s chief minister and DeVere a favourite courtier. DeVere is a favourite too amongst conspiracy theorists as an “alternative” author of Shakespeare’s work. Once a comparison is made then, others can be introduced to firm up the idea. In the case stated here we commonly find Ophelia, Polonius’ daughter, being compared to one of their women folk – DeVere married Anne Cecil, Lord Burghley’s daughter in 1571. Polonius is portrayed as a councillor who is valued for his arcane wisdom, but not entirely to be taken seriously. His advice is sometimes asked for and sometimes he gives it when he thinks the situation merits it. Lord Chamberlain to the king, though not of the upper nobility himself, he clearly has some ambition otherwise he would not have attained that position. A benign paternal figure, he has a son and daughter whom he loves and therefore takes as his due the right to advise them. So far, then, we have a character who could fit literally hundreds if not thousands of persons not only in Elizabethan England, but in our own age too. William Shakespeare had plenty of observable material from which to construct his Polonius, but who would have been the closest to him? Who was the one man most likely to influence the way he drew the character? It was his own father, John Shakespeare! It is too common, when discussing issues around the works of Shakespeare, for writers to become dazzled by the names and titles of important historical personages and tend to miss out those others who are just as influential, but whose presumed insignificance is often ignored. We want to hear of a “. . .Muse of fire that would ascend the brightest heaven of invention, a kingdom for a stage, princes to act and monarchs to behold the swelling scene”. (Prologue Henry V). How could a mere glove-maker from a small provincial town possibly have a place in all this? 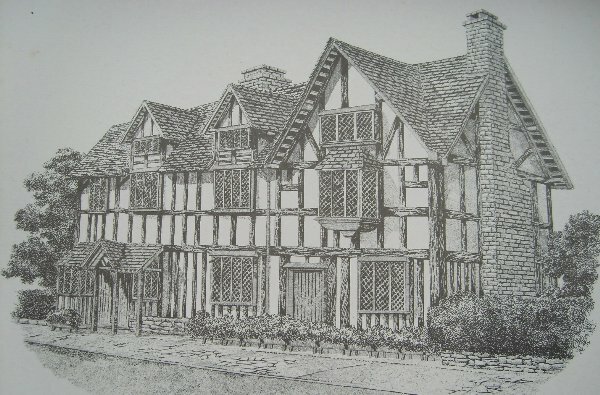 Often it is disregarded that William Shakespeare actually had a family, which he supported at Stratford and to whom he returned at regular intervals. As real people they were just as viable a material to a dramatist as anyone else. John Shakespeare was ambitious. In 1569 he had applied to the College of Heralds for a Coat of Arms to denote the status of his family at Stratford. He was an alderman and for a time High Bailiff of the town and wished to be known as “A Gentleman”. Unfortunately, this first attempt at social elevation came to nothing when his application was turned down. (He would have to wait until 1596 when a second application made by his son William was successful). During the 1570’s he seems to have experienced severe financial problems and fell into debt, and it was this that probably projected his eldest son, William, towards the player groups in London. So in John Shakespeare we have a man whose son is leaving home and naturally he cannot resist giving him fatherly advice. That advice, of course, would have been coloured by his own experience of life at that time. John’s problems with debt would no doubt provoke the remark “neither borrower nor lender be” as this is what had brought the Shakespeare family low. We can easily imagine the agony that he had suffered due to debt and he would naturally want his son to avoid a similar fate. Both John Shakespeare and Polonius had a clear idea of their similar positions in the class structure of their respective societies and so it is simple to identify Polonius’ cautious advice regarding dress as being that of a middle class Englishman of the period (though the term middle-class was not used at the time). “Costly thy habit as thy purse will buy / but not expressed in fancy; rich, not gaudy . . .” This is the advice of a financially prudent father to a son who is leaving home. They are not the words of an aristocrat to his son. Such a man would have had little regard as to the cost of costume, because expensive and showy attire was one way to become noticed at court and to proclaim rank. No doubt John would have spoken in a similar vein to William and the son would have taken note, though not necessarily too much. William may have taken some of his father’s advice and placed it into the mouth of Polonius, but that does not make the whole character a copy of John Shakespeare. The other actions of the character were there to suit the plot of the play, not to provide posterity with biographical detail. For all we know William might well have overlaid the character of Polonius with aspects of other personages, perhaps Lord Burghley was one. As a dramatist he would want to introduce elements that all of his audience and, more importantly, his aristocratic patrons would recognise. This is why we find references in the work of the Bard that can be linked to contemporary persons and events. We must always remember that he had a living to make and he needed to advertise. William Shakespeare took from his father just that which he needed and no more. Polonius is not a depiction of a single contemporary person, but a compilation of several. If we feel we need to identify an actual person behind the character, then John Shakespeare as Polonius is a rather better bet than the aristocratic others that conspiracy theorists might claim to have identified. We find in this example of Polonius not a biographical reference as such, but rather the Bard using his observation of an ordinary life to depict great drama. It is why William Shakespeare is pre-eminent today. He identifies those common thoughts and feelings that we cannot express for ourselves and places them into the mouths of his characters. We identify with them because they are as familiar to us as we are to ourselves. He makes us greater than we know. Here is a link to the Shakespeare Birthplace Trust.